What is cross examination? Generally speaking, cross examination is the process of questioning the witness about their knowledge of an event. The purpose of cross-examination varies with each case. Cross examination is not only asking a witness about their testimony, but also questioning the witness about other facts which, if he or she is a credible witness, they would be able to answer. Sometimes, through proper cross-examination, a witness’ testimony can be challenged because, if they are to be believed about what they testified to, they would also have knowledge of other relevant facts, and not just those to which they attested. A witness’ inability to testify as to all relevant facts, can call into question all their testimony. Another purpose of cross-examination is to show a motive, a prejudice or a bias, and by doing so, calling into question their testimony. Exposing a witness’ familiarity with a party involved in a lawsuit, or obvious sympathy to anyone involved in a lawsuit, is a method for challenging the witness’ testimony. 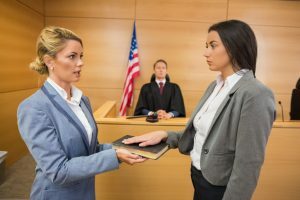 One of the most common cross-examination methods for calling a witness’ into question is to ask about prior inconsistent statements he or she made before taking the stand. These prior inconsistent statements can be from earlier deposition testimony which is taken under oath, a prior statement made to another witness, a police report, a witness statement or any other document which shows what the witness previously testified to and which now contradicts the testimony that the witness is providing on the stand. Exposing a witness through cross examination who is biased or prejudiced regarding an issue or a party involved in the litigation can be a way of presenting to a jury evidence that the witness should not be believed. Cross examination also can be a tool to question a witness’ competency to testify. That means questioning not only the witness’ mental capacity to testify, but also their physical capacity. For example, was the witness able to adequately see or hear an event or a person? Or was the witness at such a disadvantage when the event took place that their testimony should not be believed? Generally, the trial court will allow great latitude in cross-examining a witness. The extent and scope of cross-examination varies with each witness and with each trial. However, generally speaking, whatever evidence an attorney can use on cross-examination to show that the witness’ testimony should not be believed, that the witness is biased or prejudiced, or simply unable to testify accurately due to some diminished capacity, is acceptable.